This mirror has a moulded plastic back and fitted with a quality half dome face. 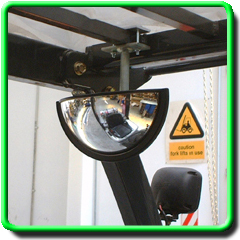 With the wide angle 180° viewing area, the driver can not only see what's behind him but also either side of the forklift. 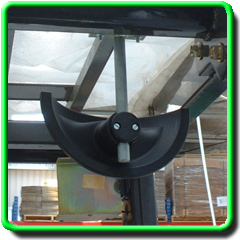 Supplied with a simple bracket system for easy mounting to your forklift in a number of positions. An industrial strength mirror designed for a long working life in a busy environment.